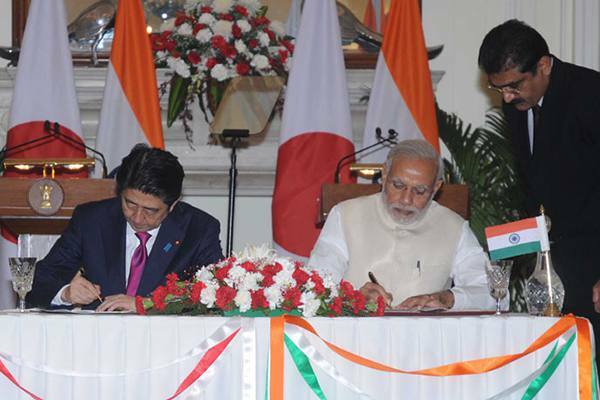 Prime Minister of Japan Shinzo Abe and Prime Minister Narendra Modi of India met last Saturday to sign several Memorandum of Understandings (MoUs). It includes a peaceful use of energy and the US$15 billion deal to build of a high speed rail link in India. The Memorandum of Cooperation was signed to introduce Japan’s High Speed Railways (HSR) technologies (the Shinkansen system) to the Mumbai-Ahmedabad route. Running at speeds of up to 320 km/h, the Shinkansen is known for, comfort (relatively silent cars with spacious, always forward facing seats), safety, and efficiency. It also provides a cost effective mode of travel. This railway can cut the travel time from Mumbai to Ahmedabad from 8 hours to just 2 hours. This technology is welcomed in India who faces the challenge of dealing with frequent delays and over 100 railway accidents in each of the past 5 years. Both prime minister also explored how the high speed railway technology can transform India’s transportation sector. The two Prime Ministers recognised the importance of close collaboration in the electricity and energy sector through such measures as use of high-efficiency and environmentally friendly coal-fired power generation technology, and Clean Coal Technology (CCT). With a booming economy , India aims to quadruple its current 5,000 megawatts of nuclear power to 20,000 megawatts by 2020 to fuel the energy demands. In addition both nations appreciated the the market for sustainable energy in the future. They have agreed to raise their collaboration in solar power generation. biotechnology, rare earths and advanced materials. Once developed, and It also promotes usage of renewable energy and energy efficiency. Prime Minister Abe lauded India’s effort to enhance contribution of renewables to its overall energy mix. Both Prime Ministers also agreed on expanding bilateral cooperation in a wide range of issues from investment and disaster risk management. This indicates the two nation’s keen interest in the national security and prosperity of one another. Both Prime Ministers acknowledged the the importance to avoid unilateral actions that can affect peace in the Indo-Pacific region. This is largely due to the sea lanes of communication throughout the South China Sea which serves as crucial communication mediums. Prime Minister Modi is also confident that their bilateral relations will key in dictating Asia’s direction as a whole . “I cannot think of a strategic partnership that can exercise a more profound influence on shaping the course of Asia and our interlinked ocean regions more than ours ‘’ he said.